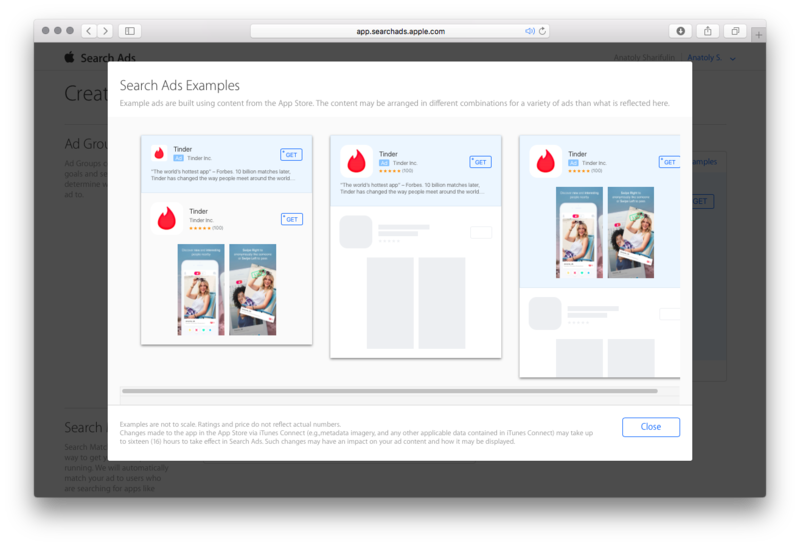 Three months ago on WWDC 2016 Apple introduced a new product — Search Ads. Today the company officially opened the registration. I’d like to explain what it is all about and what to expect from Search Ads. According to U. S. App Store 65% of all app downloads come directly from searches. That is why ASO (App Store Optimization) has become such an important part of mobile marketing. ASO is the complex process of improving the visibility of a mobile app in the store. There are a lot of articles that go through its main tips & tricks on the web. The first goal seems to be less challenging as developers learnt to work with suggestions and competitive ASO analysis. However, prioritisation has been always hard to crack as neither Apple nor Google disclosed which keywords are more popular in their appstores. Basically, it is totally unknown quantity. To meet the demand a few services entered the mobile market offering to predict which keywords will generate more traffic and how likely an app can get more visibility by using them. But these ‘predictions’ are based on side examples and can’t be applied to different apps and different languages. It appears that the only way to check the quality of optimisation and keyword weight is to launch the ASO iteration (group of new keywords) and check the impact on internal rates (impressions, views and installs). Usually 3 or 4 iterations allow selecting a set of keywords with highest potential to improve organic visibility. Unfortunately, even when this process is finished, another problem comes out — neither way app can reach the top for some keywords, win the competition and become №1. Last year someone found a solution by using motivated traffic. But this type of optimisation is artificial. It has to be always updated otherwise the app will quickly return to its prior positions. Above that, Apple has been frequently changing search algorithms to handle the manipulations. 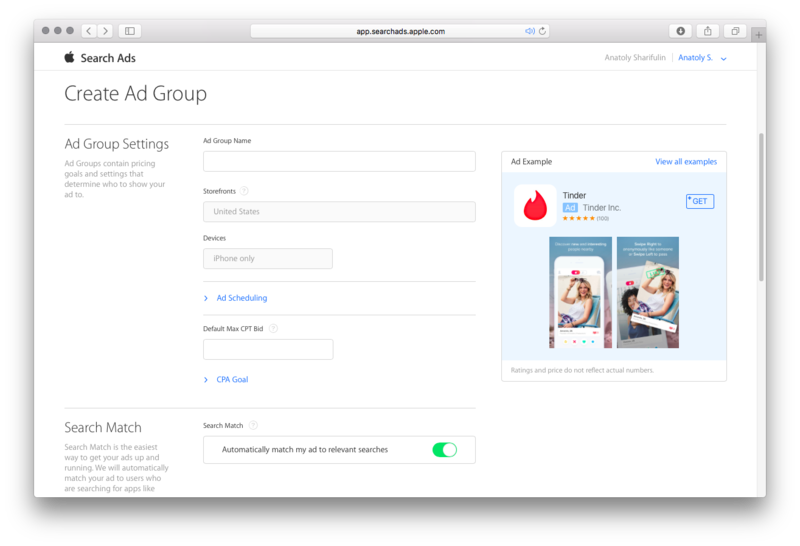 Finally, in June 2016 the company introduced a new product for mobile developers — Search Ads. 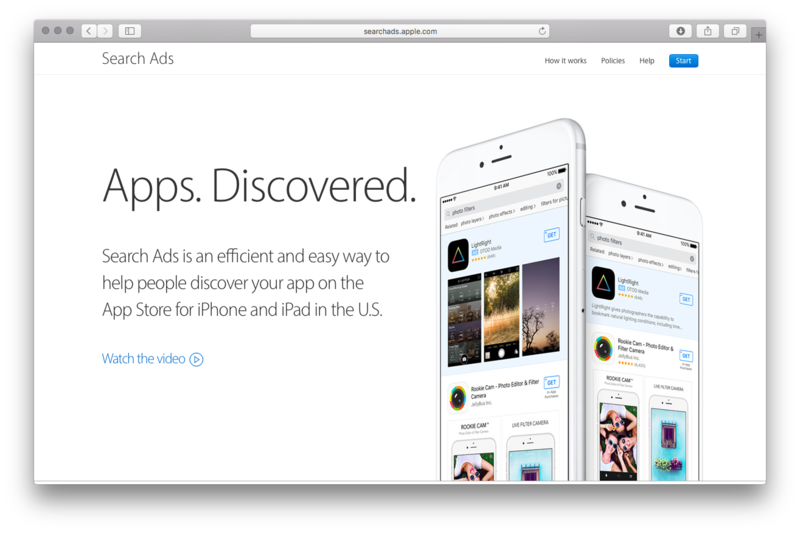 Search Ads is a simple way to advertise an app in App Store search. Right now the service is available only on iOS 10 in one country — the USA. Banner appears in App Store above the regular search results. This way an advertised app will be shown before the rest of competitors. To those who register before December 31, 2016, Apple offers $100 for initial campaigns. Full launch is scheduled on October 5, 2016. Currently registration is open only for users who applied for beta version in June 2016 and received special invites. 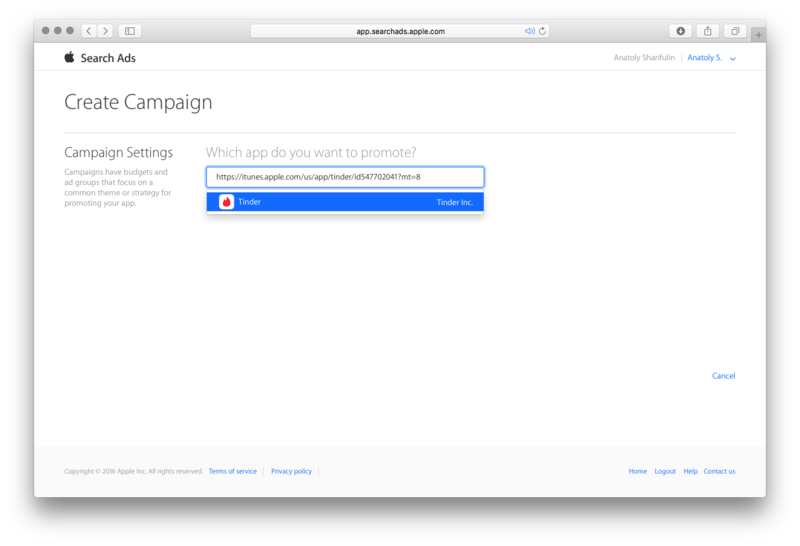 To create a campaign choose an app for promotion. 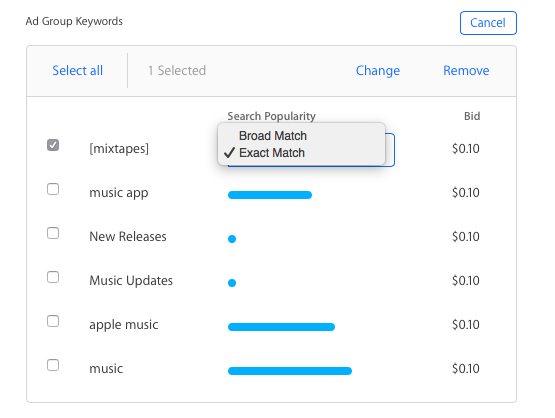 You can do it either by linking Search Ads and your iTunes Connect account or just by finding your app by name or link. The advertising campaign can be launched for any app available in U. S. App Store. Then set a Maximum Daily Spend for campaign. Set Ad Group name and choose the devices. 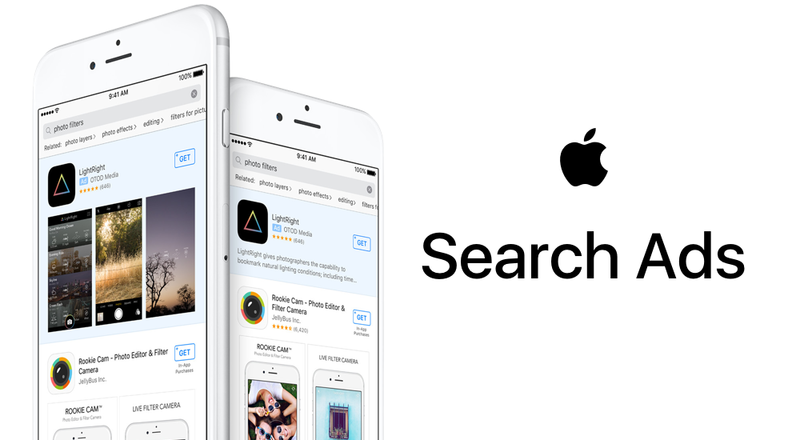 Current Search Ads limitation: U. S. App Store. If your app is working on both iPhone and iPad, you’ll be able to choose on which devices to run the campaign: only iPhone, only iPad or both iPhone and iPad. 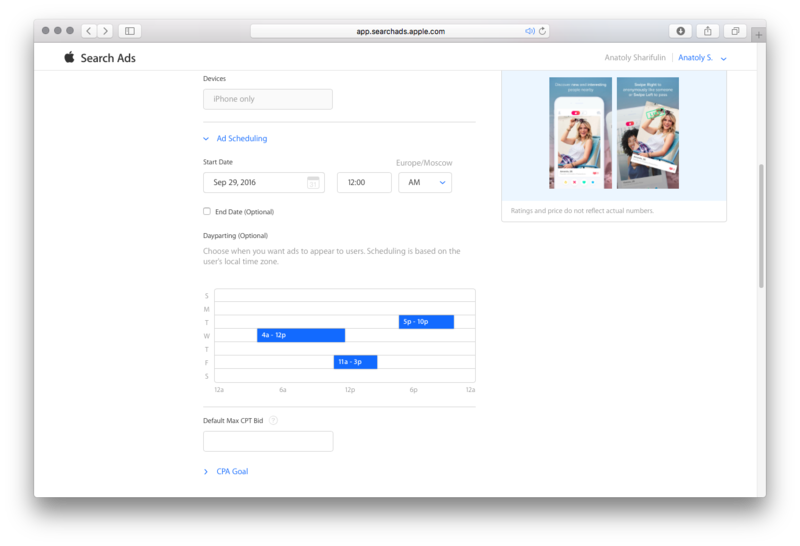 It’s also possible to schedule when ads will be shown to users considering local time zone. 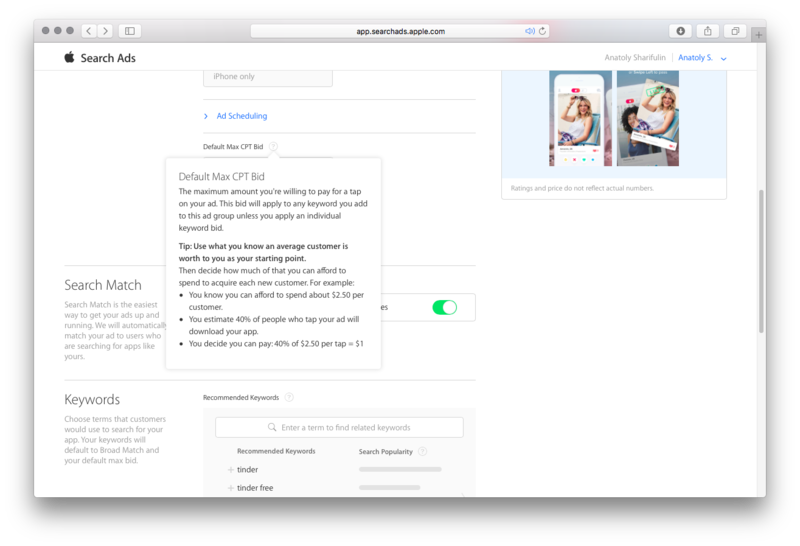 You can set up exact keywords or phrases that customers use to find your app. It’s one of the most important steps in Search Ads. To make it easier Search Ads can automatically suggest the list of related keywords for an app. Important: finally, there is a scale from 5 to 100 showing how popular keywords are in relation to each other. 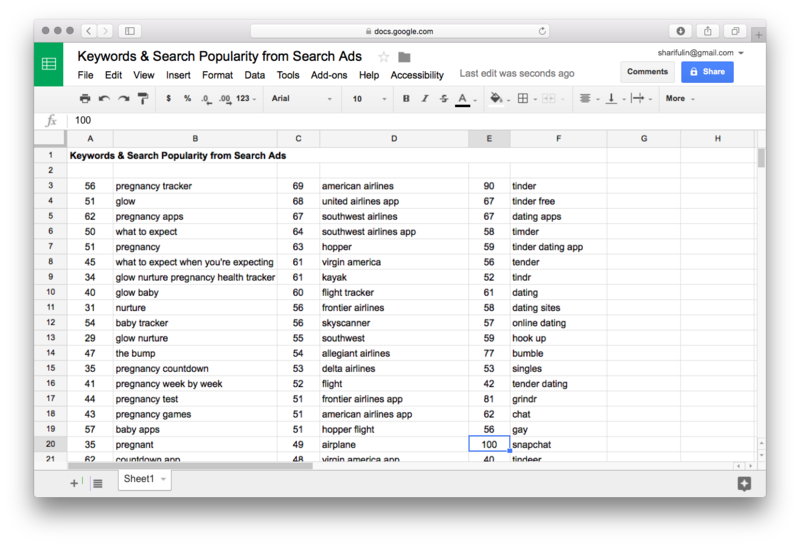 This tool is created for prioritising keywords in semantic core and available separately from ad campaigns. You can highlight negative words that your campaign shouldn’t be associated with. For example, “free” or “apps”. Enter your billing information and discount code (check the post-registration letter from Search Ads). You’re done! Just wait for the official launch scheduled on October 5, 2016. First of all, the tool gives app a chance to become the first in search results even if the competition is very high for these requests. Despite being advertised, the app placed on the top gets 57% of taps. Of course now everyone is excited and has many questions such as “How indie will compete with apps that set higher CPT?” However, there is plenty of time to figure it out since campaigns will go live only on 5 October. I think the Search Ads launch will make search optimisation for apps easier, and more importantly new apps will be able to generate search traffic. Today ASO is just unknown workaround. You don’t know how much traffic keyword generates and how to reach a good position in search chart. Marketing specialists make experiments with keywords all the time, pay for reviews and motivated installs. All this is still happening even though traffic from searches is the cheapest and at the same time the most effective. With Search Ads things get simpler. You just need to choose the app, get relevant search requests and intuitively set additional parameters. Then via new private API you can check what brings more traffic. Currently new app has no chance to reach the top for most popular requests but with Search Ads it becomes possible to buy Apple banners. The rest of requests can improve visibility in search chart with the current amount of installs. Once app gets more popular, the requests will be changed to more specific ones. There are still many questions. Search Ads works only in the USA and their scale range is from 5 to 100. It’s not clear what it is based on: views, searches or installs. What is the difference between 100 and 10? Obviously it’s not 10 times difference. We’ve already got a chance to test Search Ads. It will definitely help to improve keyword semantic as the tool provides data about relative frequency in search results directly from Apple. 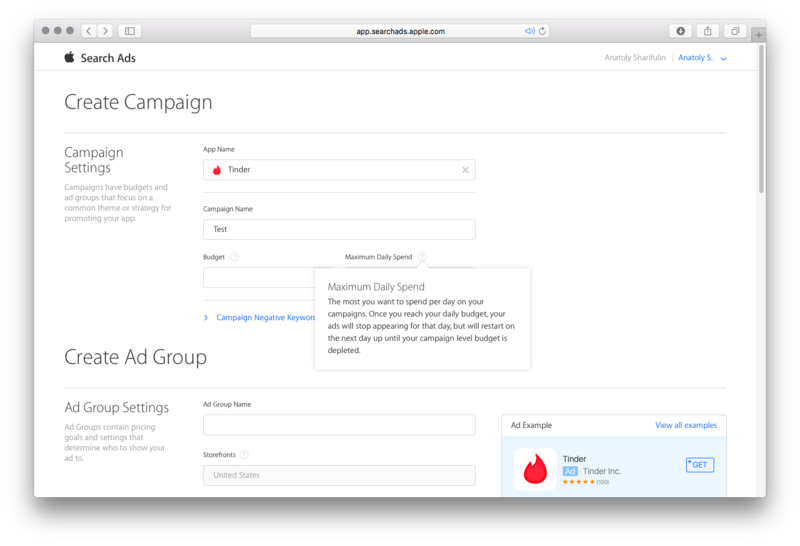 Moreover, you can start running ads for selected requests. It’s too early to make conclusions. 1. It’s possible to verify semantic core and keyword classification by frequency. Therefore quickly react and improve the app. 2. New app can start generating traffic while competitors are sleeping. Apple promises that CPT will be based on competition — if nobody else wants to use these keywords, it should be cheap. 3. Apps with good monetization rates can go ahead in their category, increase the amount of installs, become more visible in search — gain more authority for certain keywords. 4. The product helps to analyse and test new design of screenshots and icons based on differences in conversion for particular keywords. 5. Apps can have more exposure due to better optimised semantic core and high positions in search charts. Without advertising it’s hard to acquire new users that come from searches with requests only indirectly related to yours.